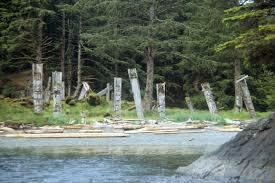 Haida Gwaii is a chain of islands the lie about 60 miles off the northern coast of British Columbia. It contains two major islands and about 150 smaller ones. The rugged, mountainous spine of the islands gives way to a network of inlets and coves on the eastern side that provide excellent cruising opportunities for recreational boaters. At the time of first contact with Europeans, the Haida were the dominant culture along the northwest coast. They traded and raided, from present day Sitka to Olympia and perhaps even down the Oregon coast. They were also acknowledged to be excellent artists and probably the finest canoe builders along this coast. MJ and Durkee sailed their J/32 Sirius to Haida Gwaii and cruised the southern half of the archipelago in 2007 and again in 2013. We enjoy cruising in areas with great natural beauty and limited development. Haida Gwaii offer this in abundance. We also wanted to learn more about the history of the Haida people and to be able to go ashore at historic village sites and talk with the “Watchmen” living there. We wanted to do this while the few remaining old totem poles are still standing.